The history of Neapolitan style of men’s suits and tailoring is an Italian legend. These are the traditions of Italian South, life of people, tailors, innate talent of those who gave this world the possibility to know and to love this men’s style forever. Yesterday, today and tomorrow Naples is the sartorial centre, centre of made to measure and bespoke, number one in the world. At the turn of the thirties in the last century, Naples was one of the finest cities in Italy. Serafini, Morziello, De Nicola, Rubinacci, Talarico, Minello were the names of famous tailoring houses and lots more within the city walls. Neapolitan fashion design was, in fact, well-known all around Italy, and was the offspring of a mixture of British style, and French and Spanish influences. For nearly three decades, from the beginning of the century until 1930, Neapolitan style coincided mainly with the British one. Thanks to lots of small companies, sartorial houses, laboratories of style and tailors the Neapolitan style became known and famous worldwide. Big names of neapolitan style the italian history of men’s suit will never forget: Rafaelle Sardonelli, Antonio Schiraldi, Luigi Piemontese, Giorgio Costantino, Antonio Gallo, Roberto Combattente, Angelo Blasi, Giacomo Bruno, Enrico Corduas e Vincenzo Attolini. This style is brought through the generations using traditional methods and technics of “needle, thread and scissors”, making famous and bringing to the world such names as Marinella, Kiton, Isaia etc. Naples and its suburbs are full of atelier – big and small, which transmit the best men’s style. Lot’s of them began their activity selling fabrics – silk, cotton, and wool. They were bringing new fabrics and colors, dictating new fashion and tendencies. Streets near these atelier were always full of european elite. And in the beginning of 20th century they were already taking a lot of orders for made to measure suits, jackets, shirts and other garments. There is nothing better in men’s wardrobe than a perfectly cut and fitted suit. Naples has taste and style, people there know everything about beauty, style and elegance, people are born with these qualities there. For historical reasons men in Naples paid a lot of attention to appearance, elegancy, style, and details. Decades ago in Via die Mille, luxury street of that time, men were walking along only to show themselves and to estimate the others. Everything was important – the cut, stitching, sleeves, softness of shoulders, lapel width, and the total appearance. Bespoke and MTM tailors were elite. They were and always will be the unique masters. In neapolitan atelier famous italian figures and politicians found their tailors, guides to the world of men’s fashion and style. Has something changed since then? No. 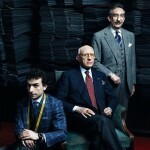 Nowadays best factories, atelier, masters and tailors are from Naples. Behind the back of every atelier in the centre of Milan, behind every boutique Brioni, Kiton, Barba and others – stands the ONE and only – NAPLES. Would you like to fulfill “Neapolitan Dream” as well and to enter into the world of ideal style, best fabrics and cut? We will get you acquainted with this world, Cardinal Buying Office will help you to get inside italian atelier and to find a tailor specially for you, to order suits, jackets and shirts made to your measures.